Okie is a happy go lucky puppy until she loses her best friend and pack leader, Kippy. Then suddenly, she has big paws to fill. She needs to learn how to travel and fly and do all the tricks that Kippy used to do to move the sheep and run the ranch. How fast can Okie learn these tricks? Can she really learn to fly and take care of Miss A? Can Okie learn how to run the ranch? What does she do when there is a break-in at the ranch? Can she protect Miss A from danger? Okie learns about antelope and prairie dogs and has a dreadful mis-adventure with a handsome skunk. Can she hold the cows back and save Miss A from their thundering hooves? 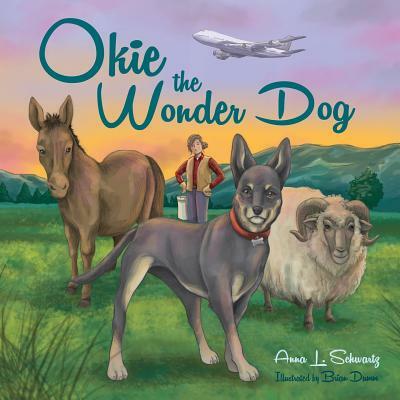 The stories tell of Okie's adventures far and wide as she travels to Las Vegas and then back home to try and work the ranch. Okie narrates her own humorous real life stories. * * * * * * Anna L. Schwartz, PhD, FNP, FAAN is a professor at Northern Arizona University and affiliate professor at University of Washington. She is internationally renowned for her research on the benefits of physical activity for cancer survivors and is the author of "Cancer Fitness: Exercise Programs for Patients and Survivors." She provides seminars and lectures and is an inspirational speaker who enjoys motivating people to reach beyond their dreams. She was a competitive bicycle racer and set three world records. When she hung up her racing wheels she picked up spurs and a saddle and now lives on a ranch in northern Arizona, which provides endless real life comical stories of Okie's heroism and adventure. Includes Readers Guide.